31 Mar : Scientists on Tuesday are stepping up efforts to detect the elusive ‘God Particle’ by triggering collision of two proton beams in the world’s largest atom smasher located on the Franco-Swiss border on the outskirts of Geneva. The two proton beams, set in motion in opposite directions of two 27-km long pipes of the Large Hadron Collider (LHC) in November last year, are currently moving at 3.5 trillion electron volts (TeV) with each beam of the protons going around the device 11,000 times every second. Physicists at the European Organisation for Nuclear Research (CERN), that houses the LHC, will make attempts to collide the two beams at 7 TeV, to create conditions similar at the time of the Big Bang -that is believed to have created the universe. 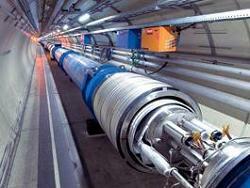 Indian scientists will join their counterparts from across the world who would observe the collisions as they happen. When the proton beams collide, 800 million collisions per second would take place and powerful detectors installed at the site would gather data of each of the collisions. It is the analysis of this data that could lead to the discovery of the Higgs boson, also called as the ‘God particle’, that is believed to have existed when the universe was born, said Prof Satyaki Bhattacharya of Delhi University who is involved in the LHC experiment. For scientists at CERN and elsewhere, the beginning of high-energy collisions will end a long period of working without any real data. Other results may point to “hidden worlds” of particles and forces that we are oblivious to because they do not interact with everyday matter. CERN Director General Rolf Heuer said scientists hope by the end of this year to make discoveries into the mysterious dark matter that they believe comprises a quarter of the whole universe. The better understood visible universe makes up only 5 percent of the universe. Dark matter has been theorised by scientists to account for missing mass and bent light in faraway galaxies. They believe it makes galaxies spin faster. A separate entity called ‘dark energy’ makes up the remaining 70 per cent of the universe, and this is understood to be associated with the vacuum that is evenly distributed in space and time. It is believed to accelerate the expansion of the universe. After two years of running, the LHC will be shut down for about a year and specialists will install improvements and make changes to enable the collider to operate at its design energy of 7 TeV in each direction to produce collisions of 14 TeV.